If you watch the news regularly, you have noticed how violent the world is today. Some people live in extreme pain and suffering. Others are living in hardships, turmoil, disappointment and regret. So the fact that I can be grateful and mean it is, in its own way, a small miracle. Gratitude is not my natural character, this took some time and effort. It was a discipline to remind myself of the many reasons I have to be grateful. Looking how good is your day, it’s always better than thinking how bad you have it. When I start my day writing and saying out loud the one thinks I’m grateful for, it help me start my day with a sense of abundance and gratitude. I’m grateful for the incredible wife I have. I’m grateful today because I can call my mom, grandma, grandpa, sister, cousins, and aunts and pick up a conversation and it feels like I never left Puerto Rico even when I’m far, far away. What started as an experiment to me, now is a habit. The truth is that no matter what your situation is, you can shift your focus to something positive. A 2003 study by Emmons and McCullough found that keeping a daily gratitude journal leads to no just an increased sense of well-being, but apse better sleep, willingness to accept change and also help and lower symptoms of physical pain. It turns out that gratitude could be the magic pill you are looking for to be happier and you can use gratitude as your new marketing strategy. Read more here. Being grateful for what I have and what I want in my life has transformed my me and those around me, and it can better your life as well. 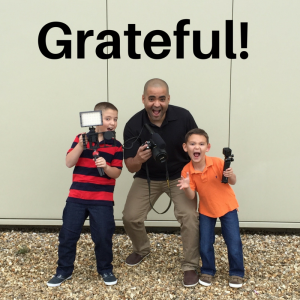 I challenge you to take some time today to come up with a gratitude list. Then share how you felt, I’ll bet it is a great feeling.